Greene is a meticulous historian, who provides sensible answers to some of the most contentious questions surrounding the beginning of the Petersburg Campaign. Among the fascinating questions he addresses are: Why did the Union Army fail to take Petersburg on June 15 and 16 when it clearly had taken Lee by surprise? What explains Grant’s disengagement from military operations throughout much of June and July, 1864? Who is to blame for the disgraceful lack of leadership at the Battle of the Crater? Greene’s account of the Battle of the Crater is heartbreaking. Lieutenant Colonel Henry Pleasants’s plan to dig a tunnel under a Confederate fort and then blow it up is truly incredible. The idea actually had great promise, though ultimately it resulted in tragedy. Initially, the creation of the tunnel was successfully completed, despite numerous logistical challenges. Pleasants could rightfully claim that he had “projected, undertaken, and completed a gigantic work; and have accomplished one of the great things of this war.” Unfortunately, the strategy for exploiting the aftermath of the explosion was deeply flawed. The Battle of the Crater became one of the greatest disasters in American military history. The six weeks covered in Greene’s fine book were among the darkest of the entire Union war effort. One northern junior officer said at the time, “I fear the greater part of this ‘heroic army’ would vote for peace at present on almost any terms.” After the Crater debacle, Grant desperately needed to turn things around. 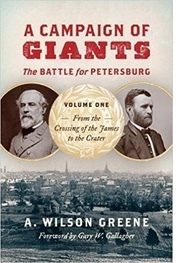 Readers will eagerly await Greene’s second volume on the Petersburg Campaign to see how Grant did it.